The Discussion Board is the class’s area for posting ideas, questions and answers. The Discussion Board can contain multiple forums that the Instructor creates. Use the Discussion Board in order to participate to course discussions. Click Tools from the Course menu. A Discussion Board may contain several forums created and managed by the instructor. Each forum may also be graded. To participate in a forum click a forum-hyperlink and create/enter a thread so as to join a discussion. Forums containing unread posts appear in bold. 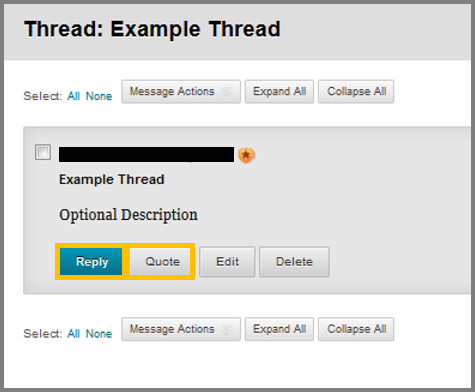 Additionally, each forum may contain one or more conversations named Threads. Threads, are used by users to discuss a topic or a group of related topics. They consist of messages, a main posting and all the related replies. Click on the subject of a message in order to read it and reply to it. Click Create Thread (A) so as to open a new topic for discussion concerning the related forum topic. Fill in the subject of the Thread. Insert an attachment, either from inside the course by clicking Browse my Computer. Navigate to Tools > Discussion Board. Access a Discussion Board and then select a forum. While inside the forum, select the thread you want to reply to. Hover your cursor over the Reply button, in order to reveal additional options. Click Reply and write your reply in the message field that will appear. You can also change the subject title. Click Quote if you want to include in your answer, the post’s text. Copyright © 2014 The American College of Greece. 6 Gravias Street GR-153 42 Aghia Paraskevi Athens, Greece Phone: +30 210 600 9800. Accredited by the New England Association of Colleges. Undergraduate Programs validated by the Open University, UK. The American College of Greece-DEREE College, a non-profit institution, admits students of any race, color and national or ethnic origin and does not discriminate in its programs.